What first comes to mind when you imagine the perfect workspace? Cute decor, a bright color palette, eclectic furniture? Or does a quiet space with pictures of your family displayed neatly on your desk seem paramount? Our workspaces should beckon us to pull up a chair and create awhile. They should be areas where we look forward to working—environments where we are comfortable, inspired, and where our creativity roams free. God created each of us distinctly different from one another. We’re uniquely wired; what inspires creativity in you may not ignite it in someone else. To design a space that encourages our unique creativity, we’ll need to determine what inspires us—and what doesn’t. Not everyone is productive in the same type of environment. Some of us need a quiet, tranquil setting to get our creative juices flowing, while others require a bit of bustle around them. 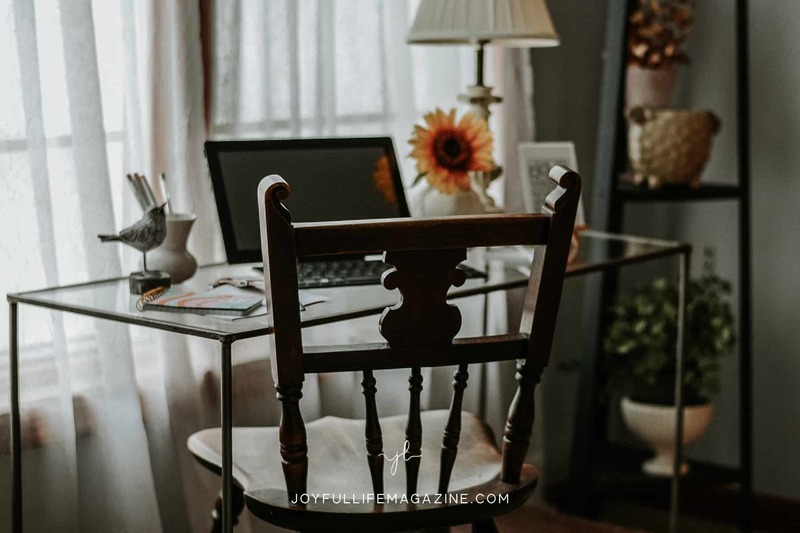 If you’re easily distracted and need a calmer space to work, you will want to choose a location with lower noise and traffic levels in order to do your best work. If you thrive in a busier environment, try to select an area that’s full of activity—a little background noise may be exactly what you need to spur your creativity. Another environmental detail to consider is lighting. Because you will be working in the space, you’ll want to ensure there is ample light available. If your space is dim, lamps will need to be brought in. Also, keep in mind that areas with natural light from windows may not need as much artificial lighting during the day; however, if you plan to work after sunset, you’ll want to place a lamp or two in your space. It’s also a good idea to have other lighting options on days when the sun is hiding behind the clouds. How much room do you need? Some of us work well in tight spaces, while others need a large, open room. When deciding where to set up, it’s essential to pick an area with enough room for you to work comfortably. Also, keep in mind the type of work you will be doing. Larger projects will naturally require ample space. Will you be purchasing furniture? If so, measure the area—as well as the furniture—before making your purchase. Having the right size furniture is just as important as enjoying the style of furniture you choose. Furniture that’s too small will make your space feel bare while large pieces will make it seem cramped. If you’re short on space, you may want to consider purchasing a work table or desk specially designed for smaller areas. Now that you’ve chosen your space, it’s time to think about decor. Because you’re likely to spend a considerable amount of time in your area, I recommend doing a little self-examination before committing to a particular style or theme. First, decide which colors you prefer. Are soft pastels your thing? Do bold and bright colors make you come alive? Do warm neutral tones get your ideas flowing? When selecting your colors, try to imagine what it would be like to be surrounded by them; the color palette you choose should be one you’ll enjoy having around you. Once you’ve decided on a color, you’ll want to pinpoint your style. What type of decor do you prefer? Is it simplistically modern, fun and funky, cute and whimsical, elegantly traditional? The style you choose should speak to you. If you plan to go with a specific theme, it’s good to pick one that motivates your creativity and productivity. If flamboyantly vibrant designs draw you in, go for it! If bolder designs distract you, choose a more subdued, serene theme. Does a cluttered space stifle your creativity? If you’re like me—and clutter distracts you—make sure papers, writing utensils, art and craft supplies, and office necessities—have a designated home when you’re not using them. Get the right organizational items for your space. You can find an array of storage items available for purchase in most any store these days, making it easier than ever to keep our workspaces tidy. Before you head out to shop, make a note of every item for which you need storage so you won’t have to make a second trip. If you’re a do-it-yourselfer, or budget conscious, get creative with the items you have lying around the house. Jars, baskets, and coffee cups are perfect for storing supplies. Fill your workspace with things that inspire you. What ignites your creativity? Is it your family? Consider framing a picture of them to place on your desk or create an entire wall display of multiple photos. Does nature stimulate your mind? Bring the outdoors in by placing a few potted plants around your space or hang some of your favorite nature pictures on the wall. Is there a particular quote that encourages you? Print it out and frame it to display on your desk, or paint it on the wall above your workspace. Now that we’ve covered five essential things to consider when creating the ideal workspace it’s time to start designing. As you plan for your space, have fun and enjoy the process! Try not to get overwhelmed or feel as if you have to create the ‘picture perfect’ work area. It’s more important to take your time and create a space tailored to your individual needs and style preferences. Remember that God made us characteristically different from one another; we are all creatively inspired by different things, environments, and decor. By filling our space with the things that are unique reflections of our personalities, our workspaces will invite us in and inspire us to do our best work. By filling our space with the things that are unique reflections of our personalities, our workspaces will invite us in and inspire us to do our best work. Kelly is passionate about pointing others to the nourishing truth and wisdom found in God’s word. Kelly lives just outside of Nashville, Tennessee area with her husband Brandon and their two college age children. When she isn’t writing you’ll probably find her working on a new arts and crafts project, hunting for vintage accessories, or planning her families next visit to the mountains. Read more from Kelly over on her blog Blossom in Faith. You can also connect with her on Facebook and Twitter.